Both are worth your reading. Note that ProPublica report is actually a series of reports and interactive media explorations. Also, that the Moyers piece is also the next-to-last report in the ProPublica series. ■ It will take a lot of rain to make things "normal" again: "A half-decade of torrential rains might bail California out of its crisis..."
[T]he larger West’s problems are more structural and systemic. “Killing the Colorado” has shown that people are entitled to more water from the Colorado than has flowed through it, on average, over the last 110 years. Meanwhile much of the water is lost, overused or wasted, stressing both the Colorado system, and trickling down to California, which depends on the Colorado for a big chunk of its own supply. Explosive urban growth matched with the steady planting of water-thirsty crops – which use the majority of the water – don’t help. Arcane laws actually encourage farmers to take even more water from the Colorado River and from California’s rivers than they actually need, and federal subsidies encourage farmers to plant some of the crops that use the most water. And, as ProPublica has reported, it seems that “the engineering that made settling the West possible may have reached the bounds of its potential” — meaning that even the big dams and canals we built to ferry all this water may now be causing more harm than good. ■ There are levels of "water rights," and depending on who you are, you have a higher or lower level of right to the water. The highest level of water rights are called "senior rights." Rapid development and economic growth further complicate the issue of a secure water supply, particularly in the case of California's senior water rights over those of Nevada and Arizona: in case of a reduction in water supply, Nevada and Arizona would have to endure severe cuts before any reduction in the California allocation, which is also larger than the other two combined. As another example, the water rights of many farmers are "senior" to the rights of many urban entities. I'd like to comment on the third, fourth and fifth bullets above. Then I'll add this up (click to jump there). Before I deal with the climate change / global warming aspect, I'd like to draw your attention to the other structural components — yes, I disagree with NOAA — which are indeed real. Let's start with the river itself. The Wikipedia page dealing with the Colorado has a lot of great information in it. For our purposes, I suggest starting with this section, on Engineering and Development. 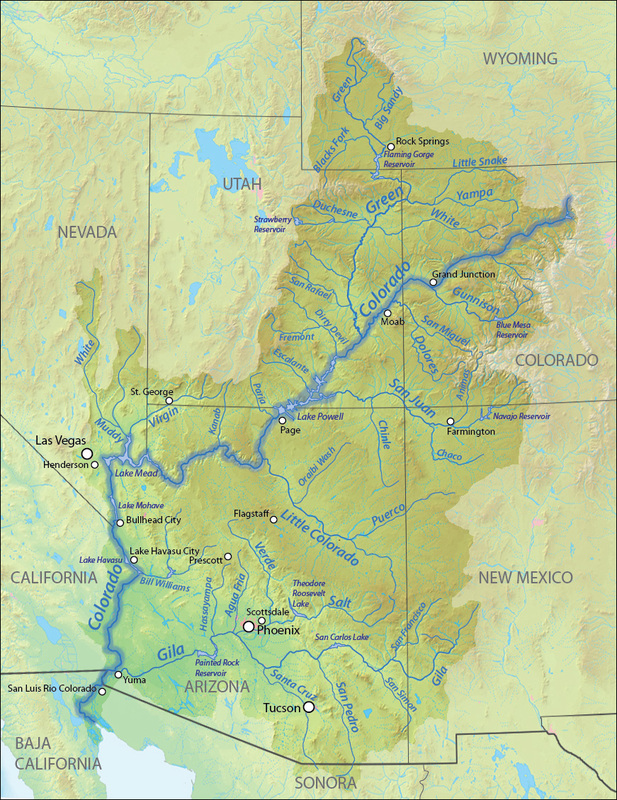 The Colorado River watershed. Note that it flows into Mexico, which also has rights to the water (source; click to enlarge). In 1922, water from the Colorado was allocated by agreement. A later agreement added Mexico. A midway point was chosen (Lee's Ferry) and water measurements were taken. Those above Lee's Ferry were allocated half of what was calculated as the flow according to the measurement. Those below Lee's Ferry were allocated the other half. 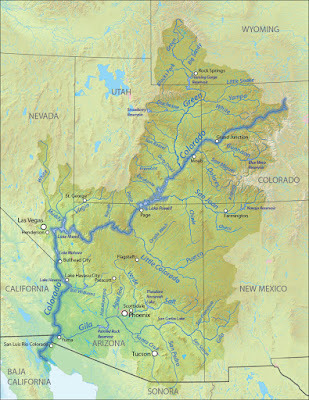 When the Colorado River Compact was drafted in the 1920s, it was based on barely 30 years of streamflow records that suggested an average annual flow of 17.5 million acre feet (21.6 km3) past Lee's Ferry. Modern studies of tree rings revealed that those three decades were probably the wettest in the past 500 to 1,200 years and that the natural long-term annual flow past Lee's Ferry is probably closer to 13.5 million acre feet (16.7 km3), as compared to the natural flow at the mouth of 16.3 million acre feet (20.1 km3). This has resulted in more water being allocated to river users than actually flows through the Colorado. Droughts have exacerbated the issue of water over-allocation, including one in the 1950s, which saw several consecutive years of notably low water and has often been used in planning for "a worst-case scenario". Bottom line: Given the fact of increasing climate change, there will never be as much water in the Colorado River watershed as there was in 1922. Colorado River water is overused, lost and wasted (click to see numbers). Urban growth in California and the Southwest generally has been strong. "Use it or lose it" water laws encourage farmers to overwater their fields. 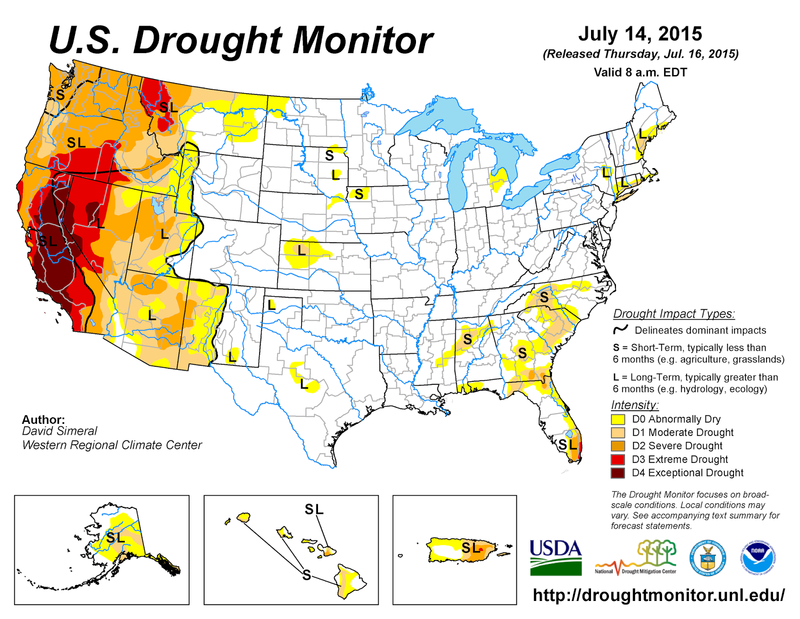 The U.S. government subsidizes the planting of very "thirsty" crops. California farmers have "senior water rights" and use much more than half of the water from the watershed. All of these elements are discussed in the ProPublica report. There is a terrific set of info-graphics here with easy to scan data. Click the "See more" links for interesting added information. Climate scientists have warned for years that rising greenhouse gas concentrations will lead to more frequent and severe droughts in many parts of the world. Although it's generally very difficult to attribute any one weather event to the broader global warming trend, over the last couple of years a body of research has emerged to assess the link between man-made climate change and the current California drought. There are signs that rising temperatures (so far, 2014 is the hottest year on record both for California and globally) and long-term declines in soil moisture, both linked to greenhouse gas emissions, may have made the impact of the drought worse. But according to new research by the National Oceanic and Atmospheric Administration, California's drought was primarily produced by a lack of precipitation driven by natural atmospheric cycles that are unrelated to man-made climate change. In other words, climate change may have worsened the impacts of the drought, but it isn't the underlying cause. Over the last three years, Seager said, unpredictable atmospheric circulation patterns, combined with La Niña, formed high-pressure systems in winter over the West Coast, blocking storms from the Pacific that would have brought rain to California. The result has been the second-lowest three-year winter precipitation total since record-keeping began in 1895. But that pattern doesn't match what models predict as an outcome of climate change, said Seager. In fact, the study's models indicate that as global warming proceeds, winter precipitation in California is actually predicted to increase, thanks to an increased likelihood of low-pressure systems that allow winter storms to pass from the ocean to the mainland. Collapse of Arctic sea ice extent. The blue area shows the range of data predicted by 13 IPCC models. The black line shows the mean of the model predictions. The red line shows observations through 2009. Data for 2012 fell below the 2009 mark (source; click to enlarge). With climate, things are never as good as cautious people say they are. Scientists are inherently cautious by nature, and climate scientists are a battered bunch, so they tend toward extra caution. Common sense says climate, dryness of the entire Southwest via heat and lack of rainfall, is a consequence of global warming. So me, I go with common sense. The drought in the American Southwest is a confluence of bad things, one of which is climate change, global warming — and that's the one that won't go away, that will constantly tighten the screw, until we deal with it directly. There will be upticks in rain and downticks in heat. But the trend? I think you'd have to be prepared to eat your words if you say the ravages of climate change weren't a deciding factor going forward. Consider — the population of the American Southwest, not just California, continues to grow. Water continues to be less and less available. Competing interests — some very very wealthy, like the big farmers and the big oil companies doing the fracking — are in a classic neo-liberal struggle for resources (and the source of their wealth) with ordinary people, like the urban dwellers of Los Angeles, San Diego, Phoenix and Las Vegas. Urban people need water to live, and by and large, they're willing to share the sacrifice with others in the state. The entitled wealthy, however, the major corporations, the mega-rich farmers, some of which are hedge funds, by and large aren't. "This is our water," said Steve Knell, general manager of Oakdale Irrigation District, to KQED's Lauren Sommer. "We believe firmly in that fact and we are very vested in protecting that right." But on June 12, the state ordered the 114 senior water rights holders with permits dating back to 1903 to stop pumping water from the San Joaquin and Sacramento watersheds, a normally fertile area encompassing most of northern California. "There are some that have no alternative supplies and will have to stop irrigating crops," admitted Tom Howard, executive director of the State Water Resources Control Board. "There are others that have stored water or have wells that they can fall back on. It's going to be a different story for each one and a struggle for all of them." This is the first time since 1977 that the state has enacted curtailments on senior holders. In response, an umbrella group called the San Joaquin Tributaries Authority (which includes the Oakdale Irrigation District) has sued the state. It's all on display in that story, the song of the very very rich — "I, me, me, mine." The social war has started. Farmers could be more efficient, plant less water-hogging crops. Consumers could eat less meat (consider the water that's poured into feed). Public officials could reconsider "use it or lose it" water laws. The government could create a "competitive water market." Government at all levels could invest in "conservation technologies." 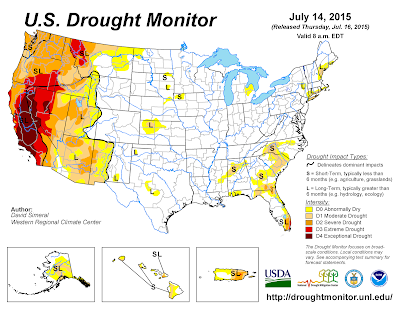 Keep your eye on that "competitive water market." It's the preferred solution of people with most of the money. It's also a trap, a way to delay real solutions. If you think climate change will constantly turn the screw until the social contract breaks in the Southwest, do you see these as actual solutions, as more than just good things to do? I don't. They are good things, but as "solutions" they are very modest. ▪ The social contract will break in California and the rest of the Southwest (and don't forget Mexico, which also has water rights from the Colorado and a reason to contest them). This will occur even if the fastest, man-on-the-moon–style conversion to renewables is attempted starting tomorrow. This means, the very very rich will take the best for themselves and leave the rest of us to marinate in the consequences — to hang, in other words. (For a French-Saudi example of that, read this. Typical "the rich are always entitled" behavior.) This means war between the industries, regions, classes. The rich didn't get where they are, don't stay where they are, by surrender. ▪ Government will have to decide between the wealthy and the citizenry. How do you expect that to go? ▪ Government dithering and the increase in social conflict will delay real solutions until a wake-up moment. Then the real market will kick in — the market for agricultural land and the market for urban property. Both will start to decline in absolute value. If there's a mass awareness moment when all of a sudden people in and out of the Southwest "get it," those markets will collapse. Hedge funds will sell their interests in California agriculture as bad investments; urban populations will level, then shrink; the fountains in Las Vagas and the golf courses in Scottsdale will go brown and dry, collapsing those populations and economies as well. Ask yourself — If you were thirty with a small family, would you move to Phoenix or Los Angeles County if the "no water" writing were on the wall and the population declining? Answer: Only if you had to, because land and housing would be suddenly affordable. All of which means that the American Southwest has most likely passed a tipping point — over the cliff, but with a long way to the bottom to go. I wish the ProPublica piece, for all its virtues, had at least considered that set of outcomes. After all, their title is pretty drastic — "Killing the Colorado." Now the real bottom line. The real bottom line — the most far-reaching — is philosophical, but it gets to the heart of a huge debate in the climate war. Which means I'm going to have to expand on this point later. In basic terms, though, it's this. The meme of the wealthy is that (a) climate proposals are a threat to "growth" — by which they mean literally GDP, but also by implication they mean "your big-screen, smart-phone lifestyle." And (b) losing "growth" is a line no consumer will want to cross; not the rich, not the poor, no one. This means that the wealthy think they have a trump card, and you see it played, for example, in those Exxon and oil industry commercials hosted by "Lying Pantsuit Lady" — as in, "Like that television you're watching? Know where its energy comes from? Yep, oil is right there in the mix." Can you hear the threat? "Fix the climate and you'll have to sacrifice your lifestyle. Can't have that ... there's a big game on this weekend." In response, climate solution advocates counter with an argument that says, in effect, "But wait ... we've got a way to keep 'growth' and also fix the climate problem." ▪ Any attempt to have (consumer) "growth" and a climate solution means we'll have neither. Put differently, all fast, effective climate solutions will involve some sacrifice of the consumer economy. The only way to guarantee "growth" in the consumer economy is to have a slow and ineffective solution — until it all comes apart. Note that the "consumer economy" is not the whole economy, meaning aggregate GDP. 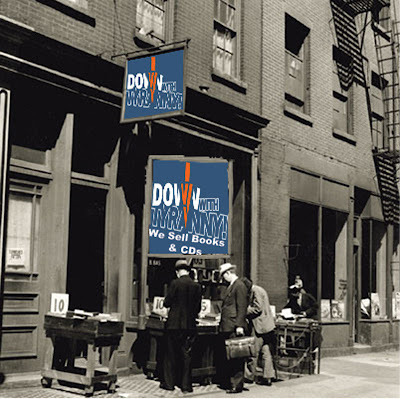 Did the World War II economy involve "growth" in a consumer goods sense? Obviously not, yet we survived and even thrived. The country cleared all the debris of the Great Depression in one swoop. All it took was willingness to sacrifice, something the American people were happy to do, given the alternative. They don't have our interests at heart in any case. Very good analysis of but one aspect of the crisis in the west. It's too goddamn late to change warming/CO2/greenhouse. The cycle is resonant at present levels guaranteeing increases forever... perhaps runaway increases. Americans generally have PROVEN, iteratively and without exception nor hope for change, to be too stupid/gullible/indifferent/corrupt to fix ANY aspect of it. Instead of allocating water sensibly, they'll prolly keep selling over 100% of it for maximum profit... and the wealthy who steal it shall never be stopped or even inconvenienced. How many poor people will be allowed/forced to die for want of water? How many more almond orchards will be planted to produce all that almond milk that seems to be so trendy? There are a lot of counterintuitive things in climate science, so "common sense" doesn't get you far. So it might seem that increasing temperatures "should" lead to increasing drought in the American southwest, but it's equally plausible that, globally, the warming "should" lead to higher sea-surface temperatures, more evaporation, more moisture in the atmosphere, and so to more precipitation. If the southwest doesn't get to enjoy that rainfall, then it would have to be for some other reason.